In 1956, Dutch horticulturist Cornelius Houweling began a small floral greenhouse and berry farm in Langley, British Columbia. 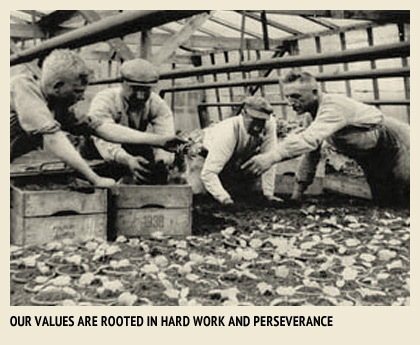 Like many Dutch immigrants, Cornelius worked hard to establish a business with a reputation for quality. This was how he chose to provide for his wife and young family of 3 boys and 5 girls. Soon after his son Casey joined the business in 1976, Houweling’s embarked upon an aggressive expansion plan. At Casey’s urging, the company purchased farmland in Delta, BC and erected a 6 acre greenhouse to grow beefsteak tomatoes. Within 10 years, large-scale hydroponic greenhouses with vines of plump and juicy tomatoes covered 50 acres. 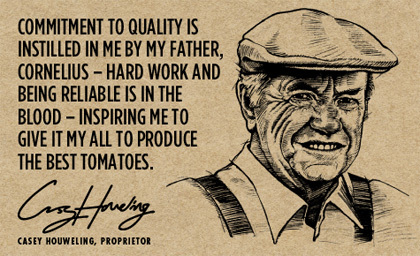 Though retailers and consumers were quick to embrace the quality and consistency of Houweling’s tomatoes, the northern climate limited production to just eight months a year. Displeased that his customers were forced to buy produce from Mexico in the winter months, Casey set his sights on California where he discovered the perfect conditions for greenhouse growing – Camarillo farmland with more than 300 days of sunshine a year. The facility was erected in 1996 and today, 125 acres under greenhouse glass and the California sun produces delicious varieties of tomatoes in an array of colors, shapes and sizes 52 weeks a year. 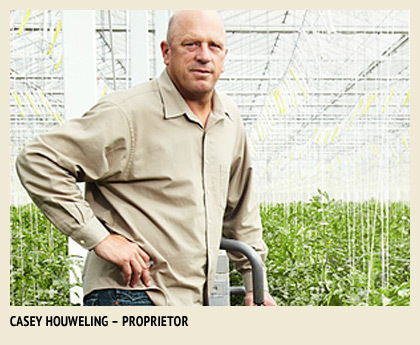 In 2014 Houweling's broke ground on its third greenhouse farm location in Mona, UT. The first 28 acres were planted at the end of 2014, delivering a first harvest in February of 2015. This location is unique as it is situated across from an existing natural gas power plant on the national energy grid and will capture the waste heat and CO2 from the exhaust stacks; literally turning waste into fresh, healthy tomatoes.